When I was a young sewist, I made a ton of circle skirts which, oddly enough, I learned to make from a Usenet newsgroup (I am old and a nerd). I wore them over brightly colored crinolines like a 90s goth version of Cyndi Lauper. The one thing that always stuck in my craw about circle skirts was the hemming. Curved edges can be quite a pain to hem, because the raw edge that you fold under is bigger than the seamline. This can result in all kinds of twists and puckers. One solution is to stitch your hems by hand. This is often my preference anyway, as I like a wide, invisible hem. But that can take a really long time, and sometimes you just want to let your machine do most of the work. I’m going to show you my technique for hemming tricky curves with a sewing machine, and a couple tips I’ve picked up through the years. Here’s the raw edge of my hem. You can see it’s got a bit of curve to it. We’re going to be sewing a 5/8 inch hem. First, stitch a line of basting 1/4 inch from the raw edge, all the way around your hem. I used a red thread so you can see the basting clearly. I like to increase my thread tension just a bit when I do this. It measures and marks a precise 1/4 inch for you, so you don’t have to do a lot of tedious measuring and marking by hand. It forms an almost perforated line, making the hem easier to fold. It very slightly eases the edge in, making it a little tighter and easier to fold under twice. Increasing the thread tension just a bit helps with this. On the wrong side, turn along the basting and press. Holding it a little taut along the basting will help you fold the edge as you press. 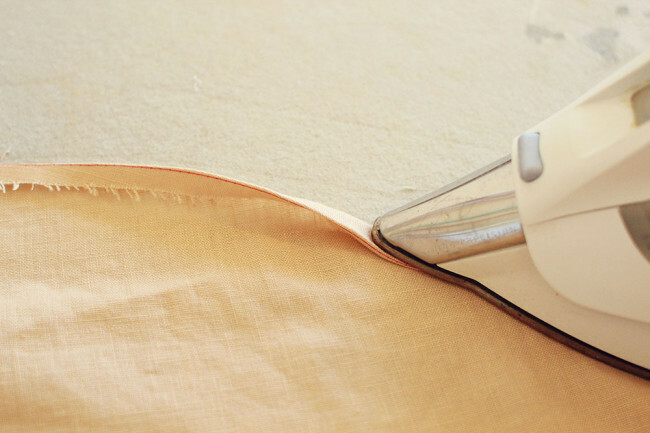 Use plenty of steam and press firmly (moving the iron up and down), don’t iron (pulling the iron side to side). One your hem is pressed, turn again and press. The raw edge should be up against the bottom fold, within the hem. You may be wondering: if we turned it over 1/4 inch, then turned 1/4 inch again, isn’t that only a 1/2 inch seam allowance? Excellent point! But I find that the extra 1/8″ is usually taken up by the turn of cloth (that is, extra fabric that is taken up by forming the folds). If you use a very light fabric, this might not be the case. In that case, if you’re really into having a hem that’s exactly 5/8 inch, you could make your original basting 5/16 inch from the edge. I don’t imagine most of us would care that much. 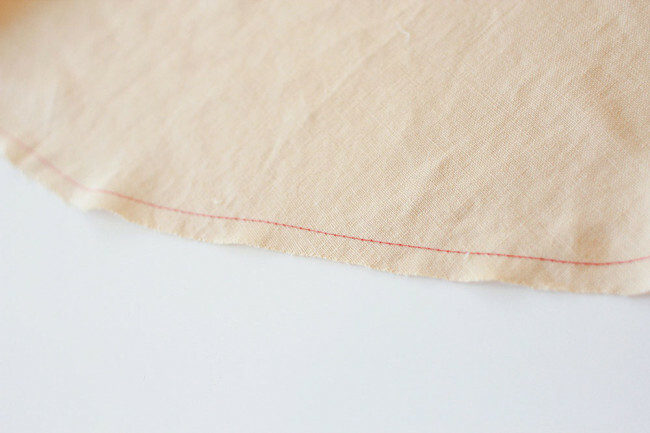 Now edgestitch along the fold on the inside of your skirt to form a perfect hem. If you have an edgestitching foot, I recommend using that. 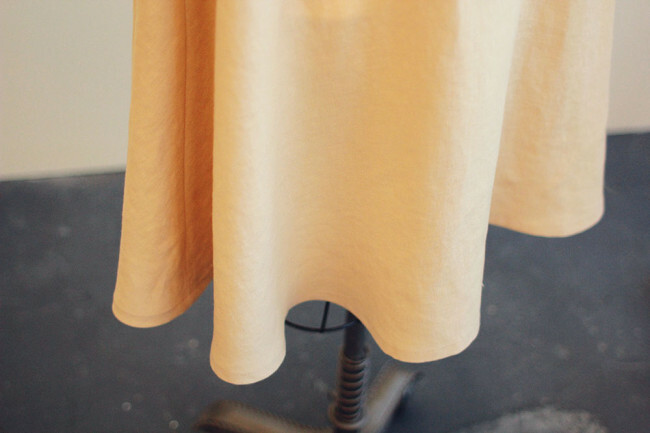 Give your hem a final press and you are done! Nice trick! I tend to use narrow bias tape on curved hems, the bias makes it easier to ease and gives the hem a nice drape. I also use bias tape on curved hems. It does give the hem a nice drape, and if it’s done in a contrasting color or print you can fold it over only once and have a pretty accent piece. I love the idea for marking the hem with basting stitches but you’d still have to do all of the tedious measuring so your garment would be all the same length (because of all of the stretch on the bias!) I love circle skirts but I hate doing all of that measuring! Why are you apologizing for being a nerd and not a kid? Recently, there have been a lot of conferences and articles on the lack of progress women have made. This kind of undermining, somewhat anti-tech attitude is part of the problem. Women and girls are pressured not to take (or seem to take) anything too serious and god help them, not to appear “weird.” Unfortunately, I see this tone on a lot of sewing blogs. Thanks for the tip. But again, it’s good to be a nerd. Most people who achieve things are very focused and some kind of nerd. There’s nothing wrong with that. I don’t think I implied anything negative about either being old or a nerd. I love getting older (way happier than when I was in my twenties). And I happily embrace my nerdiness… which includes not just tech nerdiness and computer science but many other forms of geekery (science fiction, comics). In fact, I’ve had a post brewing in my head for a long time about the similarities in various forms of geek cultures, including sewing/craft (which I think can get very, very geeky). PS: Our community guidelines ask folks not to post anonymously. I don’t think you’re being rude, I just wanted to let you know. “Lack of progress” comes from hiding under a rock. Lack of progress comes from not owning our own success and underestimating our abilities. Lack of progress comes from crouching behind anonymity. This platform, the conversations, the patterns and creativity testify to, as my daughter would say, “ownage.” (Plus, I take issue with this notion of weirdness/nerdiness somehow being implicated in a mention of women’s “progress.” Seems dissonant to me. ) I agree with Sarah: mention of nerd-hood is validation and ownership of said nerd-hood! Sarai, would love to see a posting of geek cultures and the cross-pollination therein. 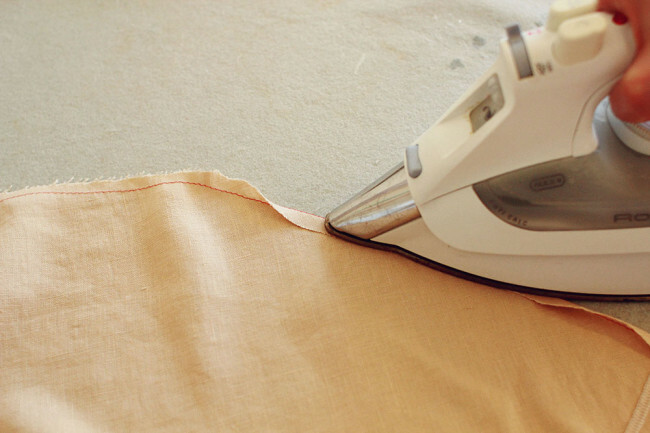 Great tip for hemming. Thanks! You think you’re an old nerd…? Usenet…? I remember programming with punch cards! Agreed. The comment makes a reference to having knowledge others might not have, not an apology. I’m in my early 30’s (not too young) but still didn’t understand the “usenet” reference, so I appreciate the point. How wonderful! This looks like a really smart trick and just in time to save my bacon, too. I’ve just chopped up an old tablecloth to make my first circle skirt! Very interesting to see you use the edgestitch foot from the inside. It certainly takes away the guessing I normally do from the outside. I never used that trick as I was afraid the outside wouldn’t look as nice. Kenneth King shared an idea that I have been loving! On the right side of your fabric, sew the seam as Sarai shared, but he uses adding machine tape on top. Then you can hold onto the paper as you turn it twice and press. Using a short stitch perforates the paper to make it easy to remove. This is very welcome – thank you! Sorry to be dense, but I’m not understanding the edgestitching at the very end. Is it like a blind hem stitch? I can’t tell from the pics if the final line of hem stitching is “invisible” like a blind hem or just fading into the cloth from a good thread match. Thanks for the tutorial and any help! I’d love to try this technique. No, it’s visible from the outside. I use the edgestitch because it makes the inside look very neat and tidy and even. Very nice! I thought that I basted an excessive amount, but it seems like that’s quite normal! It’s a really useful technique. Ah, the number 10 foot. I love that thing. This is exactly how my grandmother and mother taught me to do a hem – not just for a true circle skirt but any kind of modified circle, too. The basting is definitely the secret to getting it even and for bringing in that ease. I machine baste even if I sew the finished hem by hand, just to make it easier. 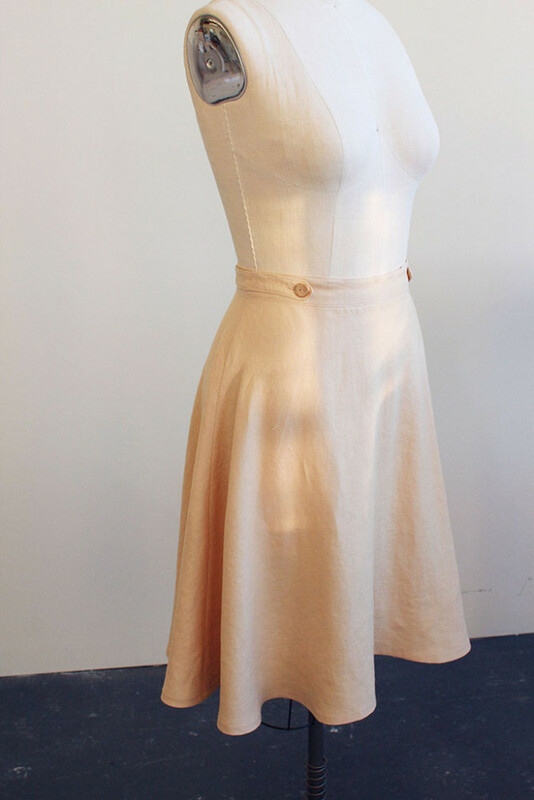 Very nice looking hem…and I have to say I prefer a small topstitched hem on a circle skirt. I do like a deep hem if the fabric is sheer but you have to make that hem perfect because it shows! So funny that you posted this today, as I just resurrected a circle skirt that I never finished from about 8 years ago! I think pinning the hem is almost as annoying as sewing the hem. I felt like the pinning went on. And on. And on. I’ve always been scared of circle skirts because of the hem. Thanks for this post! I shall now give it a try. Dang, that’s brilliant! I wish I knew that when I finished the hem of my dress yesterday. Should make my like much easier now! Thank you for sharing! Thank you for this! I love circle skirts but have such a hard time with the hem so I’m excited to try it again using these tips! Thanks for the tip Sarai. I seem to have developed a fear of circle skirts for this exact reason (I hate hemming normally and also the obscene amount of fabric that would be required to make one my size! ;) ) At least now I don’t need to worry about one of the reasons. I love the thread tracing measuring idea. Thank you thank you thank you!!!!! I’ve always hated hemming circle skirts and never could figure out the right method for easing in that extra fabric. I’ve tried all kinds of things! Lately I’ve been serging the edge and then using that as a guide to turn it under twice for a narrow hem. The serged edge acts sort of like the basting here, makes it easier to press under. I’m going to give this a try next time! 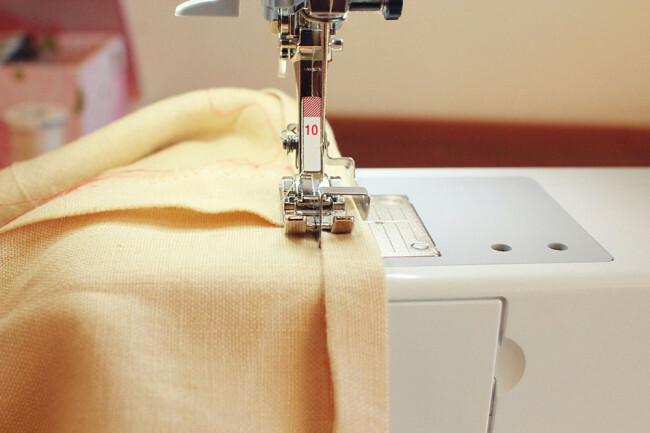 Another method that works well if you have an overlocker, is to overlock the bottom edge, allowing the overlocking to ease it in a little (if you have set you overlocker to have the right tension on a double layer, often it will ease the fabric in a little when you are overlocking a single layer). 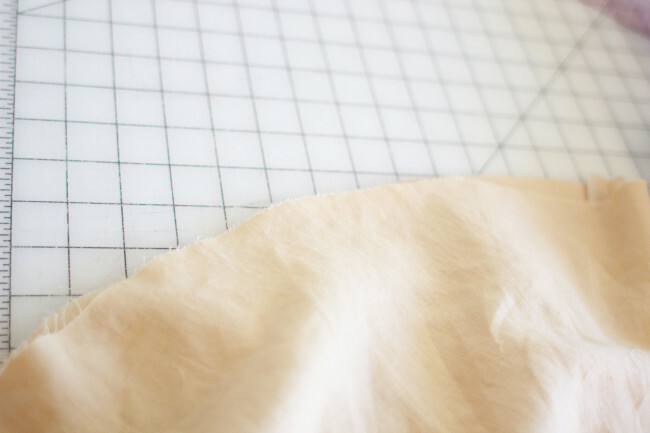 Then it is easy to press up the hem without any obvious gathering or lumpy tucks. I love this tutorial though, it gives it a clean finish inside and out! This really works! Have been using a similar method that I ‘devised’ years ago but this tutorial really helped! I actually always use a long stitch length for basting! Makes it easier to rip out. Wonderful tip! I alwasy dread hemming curved edges, but this sounds like it will make my life easier. Genius! Thank you, I will definitely try this for my next circle skirt. It’s been maddening trying to iron the curved hem consistently without the thread guide. This is fantastic! I make and wear lots of circle and half circle skirts, and yes, hemming has always been the bane of my sewing. I used to use bias tape, which I found gave the hem a bit of weight which was great for heavier fabrics, but not for light ones. These days I do a narrow rolled hem on my overlocker. It’s a really neat finish and you can also play with contrast colours too. Though it does mean you have absolutely no allowance to play with. Thank you — this tutorial is great! I hemmed my first circle skirt recently and found the whole process so frustrating. Looking at this though, I’m ready to give circle skirts another chance. I was looking carefully at the photography and I have a question: the foot you are using has this metallic limit size to direct the fabric and being regular I guess. I have never seen that before. Can you regulate the distance of it ?? I hope I am clear enough !!! Yes, that is my edgestitch foot, which is extremely useful for getting an even stitching line close to the edge! The vertical plate that holds the fabric stays in place, but you can move the needle side to side to change the distance from the edge. Lovely skirt. I don’t suppose you have a link to a pattern for a circle skirt. It “may” be a good project to kick off my sewing with. I’m going to do this on my next circle skirt. I make and wear a lot of them and have used a rolled hem foot in the past, but I really like the look of this method. I have just cut a circle skirt that has been hanging for *ahem* many months. It’s always good to let the bias drop as much as it possibly can, isn’t it! On this particular one I’m going to face the hem with bias tape (it’s a thickish wool), but I think I’ll use your method next time I make a lighter one. I made myself a grey circle skirt in my teens and wore it most winter Sundays – I could sit with one side of the fullness doubled over my knees, and still have the other side to spread over my little sister’s lap to keep the draughts away at church! So practical. I loved it. I didn’t like the patterns much, they weren’t me. Your patterns have that feminine look and I love them. Thank you so much for the inspiration, I haven’t stopped sewing since I found you’re patterns. Thanks for such a clear tutorial. I have just purchased Hawthorne so perfect timing. Thank you so much for this tutorial!! I have been catch-stitching my circle skirts by hand. I had one particular voluminous circle skirt that took several days of hand sewing before I was satisfied with the results. Thanks for the tutorial. I’m a new sewer and I ran into a problem when doing the basting stitch at the beginning. I’m trying to take an A-line dress and hem it into a tank top. I tried the basting stitch 1/4” from my cut edge three times- the first time, by changing only the stitch length dial (from 2.5 to 6, then down to 5.5), then by keeping the stitch length at 5.5 and adjusting the thread tension from 4 to 5.5. All three times, the stitching was even but the fabric gathered quite a lot. It didn’t seem realistic to smooth it all out afterward, and your instructions didn’t seem to indicate that would be necessary. What am I missing? The edge doesn’t seem outrageously curvy to me. Thanks to anyone who can offer help. I use a Husqvarna Viking Daisy. I find that it sometimes helps to hold my fabric a bit taut while doing basting with a long stitch length, to prevent the gathering of fabric. It does depend a bit on the type of fabric you’re using. Stable fabrics will have less tendency to gather up like that. Thanks- holding it somewhat taut (one hand behind the presser foot, one hand in front) helped a lot. I do not have an edge stitch foot, can i just use a regular foot and straight stitch?